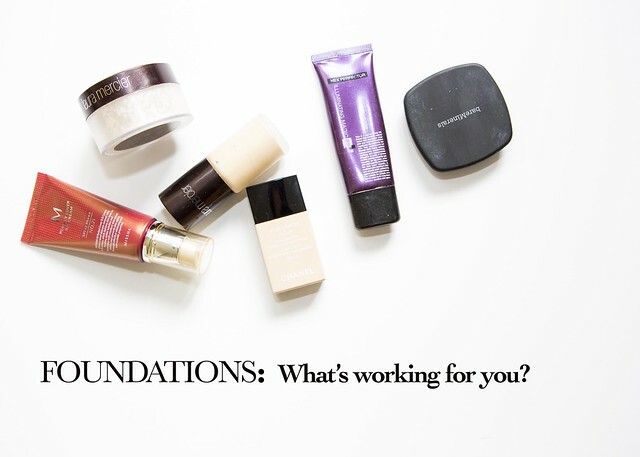 Cookies & Candies: Foundations - what's working for you? Foundations - what's working for you? Foundation.....I'm talking about the stuff that goes on your face. Nothing to do with buildings or anything remotely intellectual. But the hunt for a good foundation is the bane of my life at the moment. After watching 6 Lisa Eldrige videos on choosing the right foundations in one seating, I realized I did EVERYTHING wrong. Let's break it down. 1) buying from online sites without trying it on. #MajorFail. 2) trying it on at the beauty counter under artificial lighting. #AnotherFail. Little wonder why my super expensive Chanel Aqua vitalumiere liquid foundation looked a shade darker when I brought my little bottle home. So far, I have tons of mistakes in my bathroom with various near full bottles of foundations that are a shade darker/lighter, horrible consistency....etc. In fact, last week, I decided to perch my patootie on stool at the Chanel counter while the moody make up artist worked on my face. Result? I may have a future being a geisha. This obsessive compulsion came out of nowhere as I rarely wear foundation. Don't get me started on a primer cos that ain't gonna happen seeing that I can't even get the foundation of my make up routine right (pun definitely intended). After spending decades (4 to be exact) sleeping on one side, it's not surprising that one side of my face has pores the size of mini craters while the other look fairly decent. I was hoping a good foundation would at least fill up the trenches and give me a dewy AND even complexion. What's your favorite foundation? What's working for you now? Or is it unnecessary? Anyone?? Help??? I've given up the hunt for foundation . . . it's always a failure for me. I concentrate on concealer instead. I use it to give little swipes on cheeks, nose, chin, wherever there's a little red; then I add more if there's a bump. I have THREE, just to make clear I'm as obsessed with this as others might be with foundation. My long time staple is Edward Bess. When skin is clear and problem less, this lessens the red without adding much on the skin. When my skin is problemed, I use Clé de Peau. It has beautiful slip, great coverage that can be built without looking plastic, and isn't drying or irritating. I have to layer Edward Bess over it for blemishes. But my new love is RMS "un"concealer . . . I bought online and should have gotten the absolute lightest, but just as they say in their PR, the color does adjust on skin and my boyfriend went on and on about how beautiful my skin looked (he wasn't aware I was trying something new). It does not "cover", so it's not useful to cover blemishes, but it creates a beautiful luminous effect. Of course, choosing a concealer is much easier because there are only a few shade/color choices. I think that's why I went this direction. I've been matched properly with foundation only once in my life, and I'm sort of tired of the whole trial, including the trial of obtaining samples. BB cream for spring summer as soon as I've a bit of colour on my face (I.e. My freckles have come out!) and a Chanel foundation in winter. Pricey but mine has lasted ages & it smells lovely. Some counters seem not to give samples without wanting to do a make over / consultation first which is a shame as I'm much more likely to take the plunge on a foundation if I can try it at home for a week first thanks to a few sachets! Just an added tip - I found this site helpful for matching colour if you know of one foundation in a brand they list which is the right colour (but perhaps not finish) for you. I'd still test from a sample or at counter but it did give me a good starting point. Have you tried Koh Gen Do or Cle de Peau? Though, I find that my face actually looks best without foundation, it's just too stifling and sticky. I just subscribe to an extremely meticulous skincare regime, a little bit of concealer like Aesthetics Alterations said upthread and a ton on sunscreen. However, I second the recommendation for a BB cream, but not necessarily from Bobbi Brown. Her colors are terrific (yellow-toned) but I am not personally in love with the formulations. I think BB cream + concealer (as suggested above) might be the way to go...the Asian BBs seem to be the best with coverage/pore-filling, but since you want to try in person I'm not sure what selection is available? I know in the US, Sephora carries a few, and some of the Korean markets here in Atlanta have some...maybe Amore Pacific, for one of the brands Sephora carry. I would take a peek at makeupalley, they have tons of reviews and even forums where you can ask for product recs for your specific skin type, needs, etc. My personal favorite concealer for spots is the Makeup Forever Full Cover...that does NOT budge and covers anything...not for under eye though, as it is a bit dry (hence the long-lasting bit). For under eye, I like the Givenchy Mister Light pen, but don't know how much coverage you want/need? I do not have pronounced dark circles. Definitely give makeupalley a look, though! I've pretty much given up on using foundation as they almost never match and are too heavy. I've switched to BB creams and tinted moisturizers with a good concealer. The Olay Fresh Effects BB Cream is a good drugstore brand (inexpensive if you decide you don't like it) and for higher end I use the Laura Mercier tinted moisturizer. Oh, I've been going through this lately myself. It's torture - and it can actually make you look SO much worse if you get it wrong. There are a couple things I've learned in the last months while going on this voyage, one of which is that you may need different foundations for different seasons if your skin changes. So HG winter might be too much for you in the summer. Also, you can get just a good one in a decent match or you can actually work with two - but I suppose you need to get the routine down to begin with. Then, of course, the best of foundations might not do you any justice if badly applied. I've found that a beautyblender is a near no fail applicator, as is the Zoeva Buffer brush or Silk Finish brush, or the Sigma F80 (on the low to medium price range). Beautyblender gives you a more sheered-out coverage than the brushes. I've found YSL Touche Eclat a very nice foundation. Not at all heavy and illuminating, which is nice for those of us getting up there in the years. I loved it to bits, but it recently has stopped working for me as my skin changed. But I heartily recommend it. Also, the new Bobbi Brown Skin Foundation Stick lived up to the hype for me, at least. It really is nearly a second skin type of finish. It comes in 24 colours, so there is bound to be a good match. Get matched, get a sample, and play at home a bit. When you find it, you will know! Oh, I feel for you. I gave up on foundation and switched to a tinted moisturizer. I use the Aveeno Positively Radiant tinted moisturizer (with SPF 30) and love it. (Not sure if it's available in the UK.) I wish it had more coverage, but then it would be a foundation, wouldn't it? To start - I hate foundation. Hate it. For most of the past decade I either wore a good tinted moisturizer (Laura Mercier) or a tinted sunscreen. Enter Giorgio Armani Face Fabric. Marlene, it is PERFECT! You have to get an exact match to your skin in store but, once you do, it melts into your skin and creates a flawless base. It looks like your skin - if it was perfect. It is weightless and non-oily too. (I had oily skin in my younger days but it's become schizophrenic in middle-age. Dry and oily at the same time and depending on the weather). It only has SPF 12 so I wear it over Elta MD oil-free sunscreen with SPF 45. My skin looks 20 - well maybe 10 - years younger and all imperfections are minimized. BB creams are good (Embroylise is a favorite) but this kills them hands down when I want to look "natural" yet have that perfect canvas. For now, I've been using the Estee Lauder BB cream (it's not the best... but at least providing some coverage + SPF... I'm using it for now since my family uses a lot of the Estee Lauder skin products). I like many of the Korean bb/cc cream brands (such as The Face Shop, skin79), as they aren't too expensive, and do a pretty good job of providing the right amount of coverage, without making you look too overdone. I've been using Chanel's Mat Lumiere for years and a few days ago purchased Chanel's Vitalumiere Aqua, because I wanted a lighter, more liquid texture. I must say that I have always been very content with Chanel's foundation. They look natural on my skin tone and most of their foundations at least have a few colors that have a yellow undertone. If I don't want to use foundation, I reach for Kiehl's BB cream which gives me a slightly more coverage but still with a natural look. I hope you will find a foundation that suits you. Although lately I go bare face a lot I like to wear foundation to have a slightly more polished look. Have tried many different foundations and tinted moisturisers over the years. I would suggest going to the Bare Escentuals shop in Covent Garden to try their mineral make-up. I bought a starter pack when I was in the States, and absolutely loved it. I don't wear foundation much now, as I work at home, but when I do I use the Bare Escentuals. They have a huge range of products now. I am currently using Koh Gen Do Aqua foundation, which gives a natural and luminous finish. Another thing i loved most about it is that it doesn't have parabens, phthalates, and sulfates. It's a mineral foundation that's very lightweight and not cakey. This is star product for me. Laura Mercier Moisture Surge, Clinique CC Cream & Bobbi Brown! I have rosacea and very sensitive skin so unfortunately I have to stick to tried and tested foundations that won't cause a flare-up. It makes foundation routine/shopping very boring :) I've been using the Maybelline BB cream for a couple of years now. It's an Asia exclusive product, so I can only get it online, but it's worth the wait as it never aggravates my skin or causes break outs, which is a very big plus for me. The only downside is that it makes the skin a bit greasy after a while, so it requires powder and it's not ideal for long wear. I'm also using the Clinique redness solutions foundation, which is also good in terms of not causing break outs/sensitivity. I would love to get a sample to try the Armani Maestro, Armani Silk, and By Terry foundations, because they have gotten many good reviews from what I've read online, but have no idea how they'd get on with my skin... Oh, and the new Lancome foundation is getting some good feedback lately!